CINCINNATI — The Reds tied their club record for grand slams on July 1 and figured it wouldn’t be long before someone got the next one. 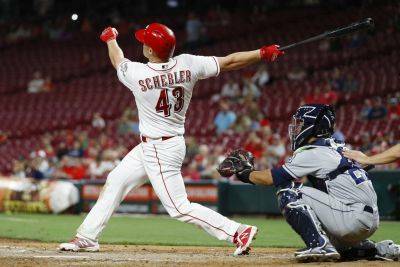 They waited more than two months before Scott Schebler hit No. 10. The Reds’ 10 grand slams have been hit by Adam Duvall (2), Scooter Gennett, Eugenio Suarez, Joey Votto, Jesse Winker, DeSclafani, Lorenzen, Peraza and Schebler. The only other major league team with at least nine different players hitting a grand slam in a season was the 2000 Cardinals, who had 10 players connect, according to STATS.